this entry covers “Savage Dragon” Vol. 2 issue 13, the Image X-Month version written by Brandon Choi and penciled by Jim Lee. Alright, right at the top, why am I doing an issue of “the Savage Dragon?” Well, listen up kids, here’s a story about the craziness of ’90s comics and it’s called “Image X-Month!” See, “Image X-Month” was a “clever” “marketing” “ploy” that was a lot more fun than was intended. In it, each of the 6 Image Comics founders, would take on an issue of another Image Comics founder’s main book. I mean, each book was pretty closely tied to each of the creators, so this would be a silly little shake up. 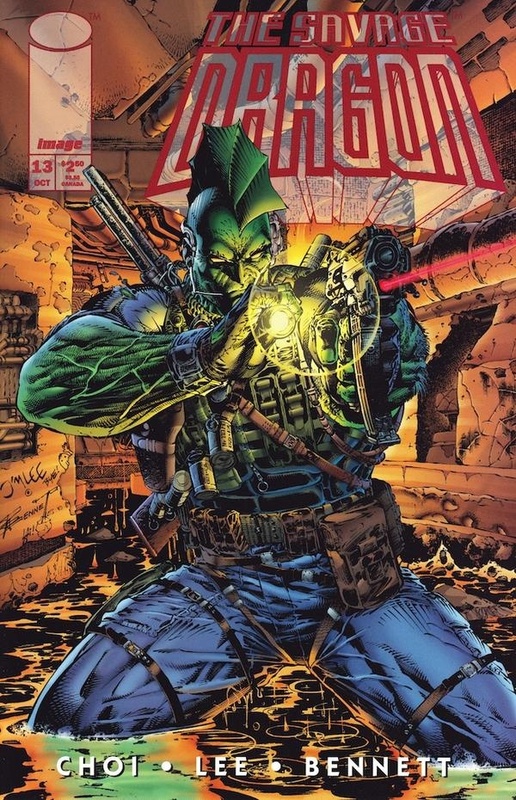 I only picked up Eric Larsen doing “WildC.A.T.s” and Jim Lee doing “the Savage Dragon” as I was picking up “WildC.A.T.s” regardless, but I wanted to see the other side of the coin with Lee and Choi doing “the Savage Dragon.” Little did I know it was going to end up being a pretty important Grifter book! Seriously though, and I’ll get into this in a few weeks, but Eric Larsen gave us a pretty fun little “WildC.A.T.s” book for Image X-Month. Sure, Savage Dragon and the Freak Force figure into the story, but it is mostly a “WildC.A.T.s” cross-over issue. In “the Savage Dragon” the Dragon is a mere bit player. If I was a “Savage Dragon” fan back then, I would’ve felt super short changed! Not sure how the other four books fared, but this always seemed a bit unbalanced to me, even though I was basically getting what I wanted, a Grifter solo book! So we pick up with Cole and Alicia Turner living it up in Chicago. We find out that this is the old stomping grounds of Cole, he grew up in Chicago, not only that, but he used to do some work for the mob as well. The mob is alive and well in Image’s Chicago, as regular readers of “Savage Dragon” know. One booth over and there is some of that well-known mob action going down. Also, out on the street, the Savage Dragon and some of Chicago’s finest are monitoring the situation. Of course, a fight breaks out. Mobsters never do mob stuff subtly anymore. Cole, seeing bullets flying gets in on the action too. Whether it’s to protect Alicia or just shoot some obviously bad dudes, it’s unclear, actually, it’s probably both. The main guys shooting up the joint are Spetsnaz and Max, and they are shooting on behalf of a new wanna-be boss named Demonseed. It’s at this point I wish I’d read “the Savage Dragon” because seeing Demonseed, who has a Darth Vader Mask on under the bubble dome on his bright red armor, that has bat wings, being taken as a credible mob boss type is nuts. But, as not a regular “Savage Dragon” reader, I guess I don’t know what Dragon nemesis Overlord looks like, so this could be keeping in line with the tone of the book. Cole recognizes Spetsnaz clearly, and Max a bit, before Max fires a bullet at Cole that causes him to pass out. Then the Savage Dragon and the police kick down a wall to join the fight. Some of the mob guys have goddamn “flash suits” and the Dragon’s partner gets shot up by Spetsnaz as he and Max get away. As sad as that all is, all I’m thinking is that “flash suits” are still hella-dumb. Next thing we know Cole is waking up in a hospital and getting grilled by the Dragon. It doesn’t last long as Alicia soon turns up pulling US government rank on behalf of I/O to get Cole out of there. While Alicia wants to get Cole to safety, he knows that he has to go find this Max character. What is so special about Max you ask? Turns out, he’s Cole’s little brother. Not only that, apparently he’s also an I/O secret agent, infiltrating the Chicago mob scene. While Cole is off talking to his bro filling the readers in on the former, Alicia is looking up I/O files figuring out the latter. Bad news for Alicia, this is when Spetsnaz breaks into her hotel and kidnaps her, leaving a note for Cole, written in lipstick on the mirror, like some horrible 1980’s urban legend. Of course during the kidnapping someone in a neighboring room called the cops, so when Cole shows up, so does the Dragon. This series of near-misses and misunderstandings is hitting a “Three’s Company” kind of level. So Cole fills the Dragon in on what’s going down. There’s an arm’s shipment at the docks for Demonseed, so he and Spetsnaz will be there to collect. Also, they have Alicia. Also, Cole has a guy on the inside, Max. The team up happens, the Dragon and Cole burst in guns blazing, Max jumps in and as soon as Alicia is free she also picks up a gun. Demonseed and Spetsnaz are on the run, trying to get away in a small boat when Cole opens a crate to find a rocket launcher and blows the escape boat to hell. And that’s it, team up over. The Dragon feels like he got what he wanted, the bad guys and their weapons off the streets, so he has no reason to detain or delay the Cash brothers or Alicia any longer. Max and Cole exchange hugs and catch up a bit, and now it’s time for Cole to Alicia to head back to New York. I’d always had this happening right before “WildC.A.T.s” Vol. 1 issue 14, the other Image X-Month book, but I realized, we have Cole here with Alicia and not in New York. It makes the most sense that this is post “the Kindred” series and before his return to New York in “WildC.A.T.s” Vol. 1 issue 12. When Cole is in the hospital we’re introduced to nurse Ann Stevens. We’ll see much more of her in “WildC.A.Ts” Vol. 1 issue 14. This is the first we see of Max Cash AKA Max Proffit, who will become a big player in the book in “WildC.A.T.s” Vol. 1 issue 21. Real world moment, Cole and Max’s secret spot is up on top of this apartment building across the street from Wrigley Field where they would watch Cubs games together. I’m trying to figure out where this could be. I grew up in Illinois, I made it to a handful of Cubs games, and have hung around the general Clark & Addison area, can’t think of any logical place this could be. Then again, it’s been ten years since I’ve been around there, there could be gaps in my memory.